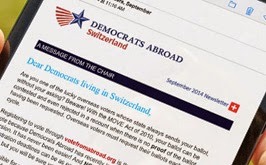 Democrats Abroad in Vaud organized a meeting on Monday, August 31st 2009 in Lully (VD) to better understand the current issues existing for filing US taxes when living and working abroad. Visit the Vaud Page for full details on what we learned (including a very comprehensive summary), contact information for our guest expert speakers, and copies of the presentations given. You can also listen to an audio recording of the meeting and hear for yourself the answers to issues related to "Who has to file US taxes? ", "How do you file when you are married to a non-US citizen? ", "What is the current Voluntary Disclosure Initiative and what is the deadline? ", "What is the FBAR and who has to file it?" and much more. The questions we received from DA members ahead of this meeting and previously posted on this blog have all been answered. Our guest speaker, Geoffrey DeHaven, Certified Financial Planner (TM) with US Tax Abroad was kind enough to take the time to provide answers to all of our questions in writing. Click on the file below. Democrats Abroad in Geneva teamed up with American Citizens Abroad and Republicans Abroad Switzerland to co-host another meeting on "US Taxes and Banking in Switzerland" on Wednesday, September 2nd, 2009 in Bellevue, Geneva at Webster University. For details on who our guest speakers were, a link to the presentation given on Voluntary Disclosures and more, visit our Geneva Page. This compilation was put together by our member, Susan Stuber, based on these two tax information meetings as well as interviews and correspondence with, chiefly, Geoffrey DeHaven. It is meant as a guideline to your most pressing questions; if you desire further information, there are footnotes to guide you to the relevant web links. At the end of the day, however, you will be well-advised to have a tax advisor who is versed in U.S. tax regulation.